Born in May 1947 in Needham, Massachusetts, Peter DeFazio served in the U.S. Air Force from 1967 to 1971. He earned a bachelor’s degree in economics and political science from Tufts University in 1969 and a master’s degree in public administration from the University of Oregon in 1977. That same year, he worked as an aide to Jim Weaver, then-U.S. Congressman of Oregon’s Fourth District, centered on the city of Eugene. After serving as a Lane County (Oregon) commissioner from 1982-86, DeFazio, a Democrat, ran for Weaver’s congressional seat when the incumbent announced his retirement in 1986. DeFazio won a hotly contested three-way primary race and then took the general election by a 54-to-46 percent margin. He has been re-elected every two years since then. During the World Trade Organization meetings which were held in Seattle from November 30 to December 3, 1999, DeFazio marched in solidarity with thousands of union, environmental, anti-globalization, and anti-business protesters. In subsequent protests, DeFazio blamed international corporations and financiers for the problems in developing countries. In 2005 he ran for the U.S. Senate seat that Republican Robert Packwood had vacated amid scandal, but was beaten by the better-funded Portland congressman Ron Wyden. That same year, DeFazio joined the Out of Iraq Congressional Caucus. In February 2009 DeFazio was one of only 9 House Democrats who chose not to support the American Recovery and Reinvestment Act of 2009, better known as the “Stimulus Bill.” DeFazio attributed his “Nay” vote to his frustration over tax-cut compromises which his fellow Democrats had made in order to win support from moderate Republicans in the Senate. “I couldn’t justify borrowing money for tax cuts,” he said. 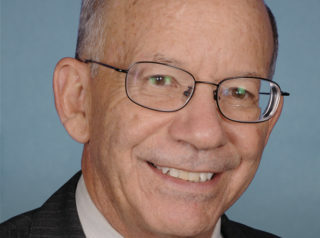 On January 27, 2010, DeFazio was one of 54 Members of Congress who signed a letter exhorting President Barack Obama to use diplomatic pressure to end Israel’s blockade of Gaza – a blockade which had been imposed in order to prevent the importation of weaponry from Iran and Syria. In March 2019, DeFazio and Democratic Senator Brian Schatz of Hawaii introduced the Wall Street Tax Act, which called for a 0.1 percent fee on all financial transactions (stocks, bonds, derivatives, etc.). Americans for Democratic Action has consistently rated DeFazio’s voting record as 90-100 percent on the left side of legislation. For an overview of numerous key votes DeFazio has cast during his career in Congress, click here. Further Reading: “Peter DeFazio” (Votesmart.org, Keywiki.org); “DeFazio Speaks on Iraq [Troop Surge] Resolution” (2-15-2007); “The Progressive Gadfly: DeFazio Explains His ‘No’ on Stimulus” (TalkingPointsMemo.com, 2-13-2009); “Rep. DeFazio: Fire ‘Timmy’ Geithner” (Huffington Post, 3-18-2010); “Rep. Peter DeFazio Investigating Impeachment For Chief Justice John Roberts” (Huffington Post, 10-22-2010); “All You Need to Know about the Misguided Financial-Transactions Tax [the Wall Street Tax Act]” (National Review, 3-7-2019); Peter DeFazio’s Positions on Key Issues (OnTheIssues.org).